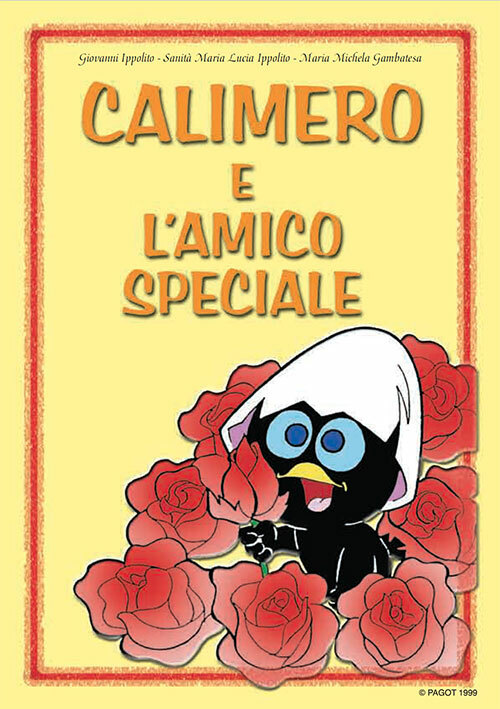 “Calimero e l’amico speciale” (Calimero and a Special Friend) is a didactic tale written by Giovanni Ippolito, Maria Lucia Sanità Ippolito and Maria Michela Gambatesa, illustrated by Pagot and published in 1999. The tale originated from the idea of improving the capability of children with autistic spectrum disorders and communication disorders to integrate with others and to have relationships; a way of explaining to peer groups the peculiarities of their special friends. The tale sets itself as a tool for the active involvement of peers who are regarded as fundamental figures in the global therapeutic project for autistic children with disabilities. In a project of school integration, this tale aims at creating a particularly favourable environment for the disadvantaged child. From this perspective, the child is no longer the only objective of the intervention, but also the environment and the people who share some life with him/her. Establishing a good relationship is an important pre-requisite for working successfully with a child affected by autism. Peers, adequately sensitized, can help us achieve this result thanks to their spontaneity and empathy, thus acting as suitable figures to activate interaction sequences that can facilitate the social growth of the autistic child. The tale, written for nursery, primary and secondary school children, has indeed a suitable and useful content for people of all ages and cultures. And thanks to these features it has enjoyed great success throughout Italy. It is distributed by the association “Il Cireneo” ONLUS in San Giovanni Rotondo (Foggia) thanks also to the support of numerous associations of parents with autistic children.